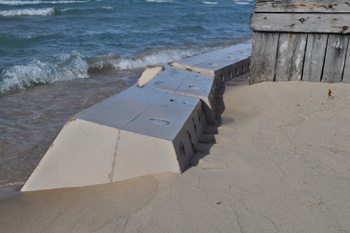 The Sandsaver is a natural solution to beach erosion that provides a cost effective alternative to traditionally accepted methods, such as beach dredging or beach re-nourishment. Sandsavers innovative modular construction allows for use in multiple locations, across multiple seasons. Easily installed, removed and re-located. 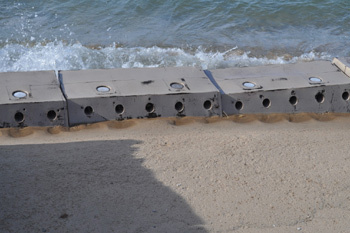 Sandsaver is a cost effective, potentially permanent solution to extremely expensive, yet ultimately temporary traditionally accepted methods of beach dredging or beach re-nourishment. 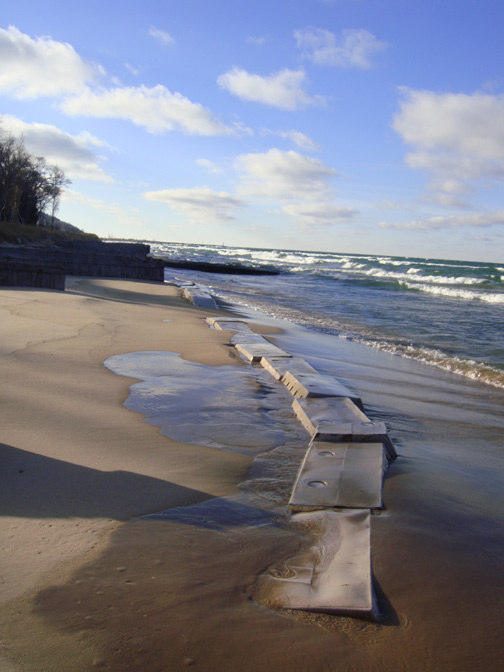 As many communities and experts have experienced or proven, beach dredging methods often contribute further to increased beach erosion. Sandsaver actually accretes beach on adjacent properties. Sandsavers innovative modular construction allows for the units to be utilized on a temporary, semi-permanent or even permanent basis. This allows for potential use in multiple locations or multiple times in the same location. 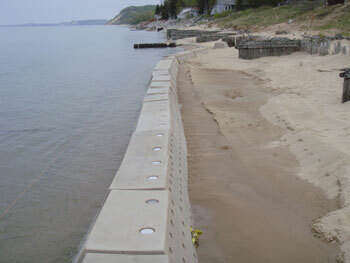 Maximize your return on investment with the ability to naturally re-nourish with Sandsaver's beach erosion solution. Sandsaver touts a virtually indestructible construction from 100% recyclable Food Grade Polyethylene. 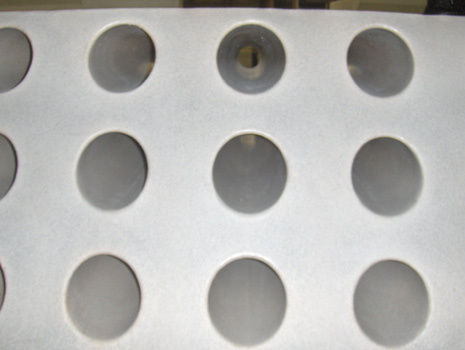 Being produced via the rotational molding process allows for a stress free product, that can withstand the harshest of environmental elements mother nature can dish out. Remove gas guzzling, high CO2 emitting barges from the evironmental equation. Unlike dangerous hopper dredges that impact floral, fauna and abundant sea life, the Sandsaver does not endanger wildlife and reduces the total carbon footprint. Manufactured from 100% recyclable, food grade polyethylene, Sandsaver is not only the financially responsible option but also the environmentally friendly alternative to beach re-nourishment. 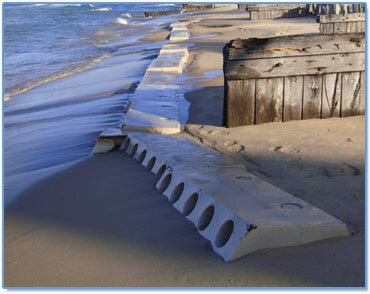 The Sandsaver is quickly becoming one of the most sought after natural solutions to beach erosion. 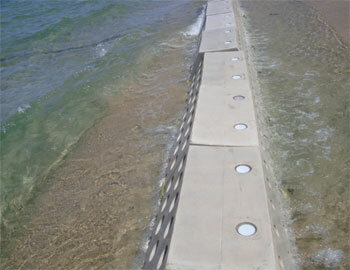 The sandsaver drastically reduces the costs of beach re-nourishment, via using the energy and wave activity of the water. Based on simple conservative economics, that show the modules can be used on a temporary or permanent basis contingent upon the breadth of the given re-nourishment project. 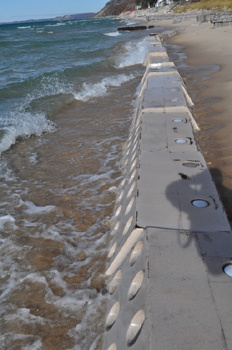 With recent proven success, the Sandsaver continues to garner immense international interest as a viable replacement to traditional, less effective methods, ranging from beach dredging, or re-nourishment and other hardened structures such as coastal armoring, sea walls and more. The Sandsaver is an improved, innovative technology based on past proven technology that was readily used in multiple locations spanning multiple decades, called "The Sandgrabber". The Sandgrabber technology worked in multiple installation locations across the United States, including Hawaii, New Jersey and Louisiana. Compare the 2 views above of the Wheatley Province Park install to see the enormous amount of sand restored in only seven weeks. 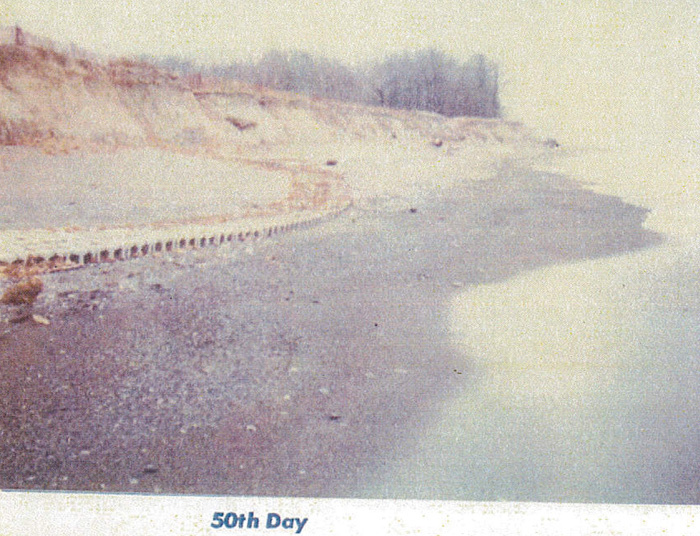 Erosion has stopped and the sand has almost completely engulfed the "SANDGRABBER" system. 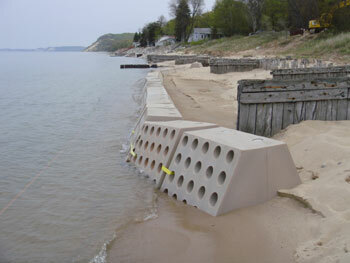 The Sandsaver improves upon providing a viable beach erosion solution where The Sandgrabber left off. 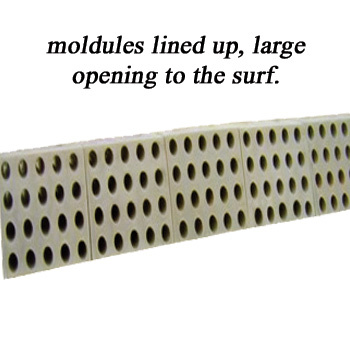 The Sandsaver modules work in two ways; Firstly by breaking down the energy of the wave as the as surf crashes against the modules, thus immediately reducing erosion. Second, by allowing the wave, which contains sand to pass thru the tapered holes and allowing the sand to settle onto the beach surface. When the tide or water retreats, it has to pass back through the smaller portion of the tapered end of the module, allowing the sand time to settle onto the beach and not back into the surf, thus accreting beach surface. Eventually the modules will become fully covered. The modular construction of the Sandsaver units allows for easy removal of the units, which allows for the units to be used in a number of locations, multiple times, or simply left in place as a permanent install. 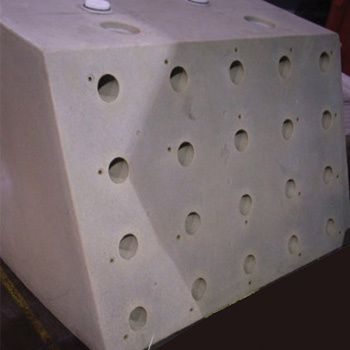 The extremely durable, rotationally molded polythethylene construction provides a nearly indestructible unit, that when properly filled with concrete, will weigh approximately 5200 pounds. Right: The Sandsavers nearly completely submerged in sand, with great results on both sides of the modules. 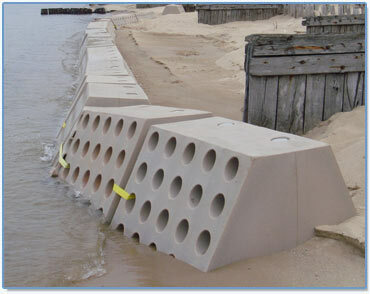 Sandsaver is the only modular system, that promotes beach accretion, while preventing beach erosion. Rotationally Molded from nearly indestructible, Food Grade Polyethylene. Modular design for simple installation, no chains or rebar required. 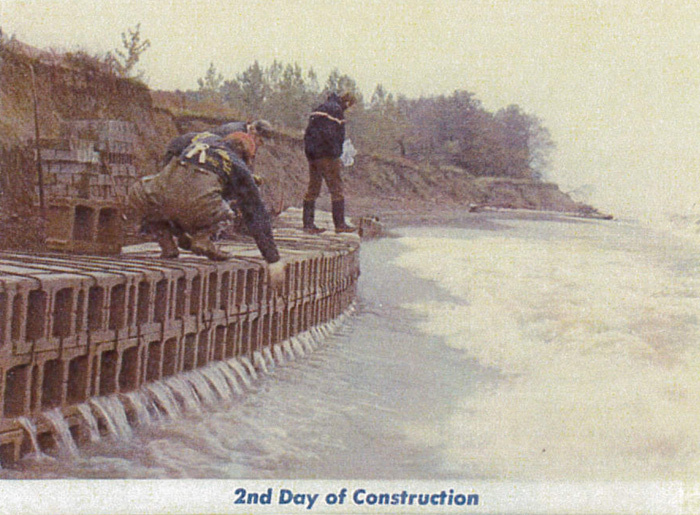 Inexpensive and re-usable in comparison to alternative/currently accepted beach restoration methods. 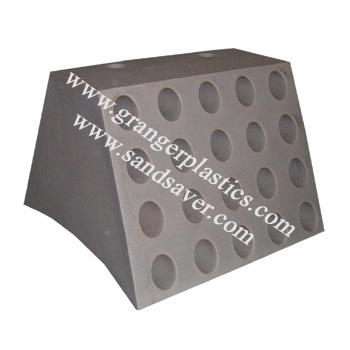 Sandsaver is molded from Polyethylene, which is 100% recyclable. Sandsaver, drastically reduces the carbon footprint of most Beach Restoration projects, by not requiring numerous, gas guzzling Barges. Sandsaver, can be re-used multiple times, for multiple installs, in multiple locations, if so desired. Or the system can be left in place permanently. Environmentally friendly, will not deteriorate, nor will the units "take in" any Sea Turtles or other living organisms, unlike any type of Dredging barges. Each module weighs approximately 5200 pounds when full; Not light weight or easily moved; Tornados/Hurricanes would have to have unheard of speeds to move a module due to the weight. Contingent upon the length of the installation, the weight of the system increases drastically. 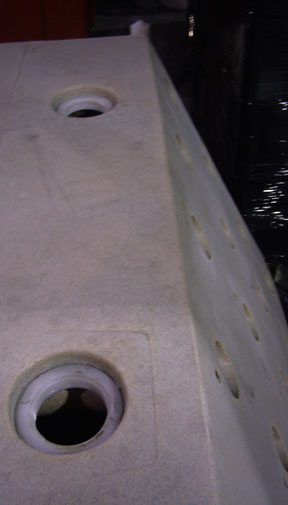 Tapered thru holes with larger opening exposed closest to surf, for easier transport to beach side of module. 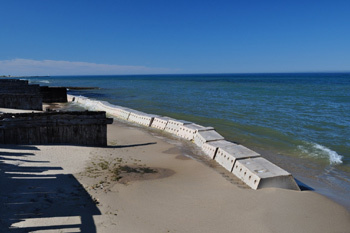 Will not leave exposed concrete, rocks, wood, or other materials that could be potentially dangerous to those utilizing the beach, alleviating those safety concerns. 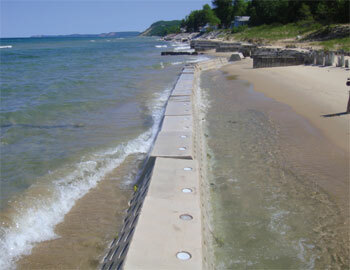 Modular system allows for as much or as little Beach renourishment as needed. Click on any of the thumbnail images below to see the pictured large Sandsaver module pop up in the gallery with caption. Click on any of the thumbnail images below to see the pictured Sandsaver Jr. module pop up in the gallery with caption. Click on any of the thumbnail images below to see the pictured installed Sandsaver module pop up in the gallery with caption. 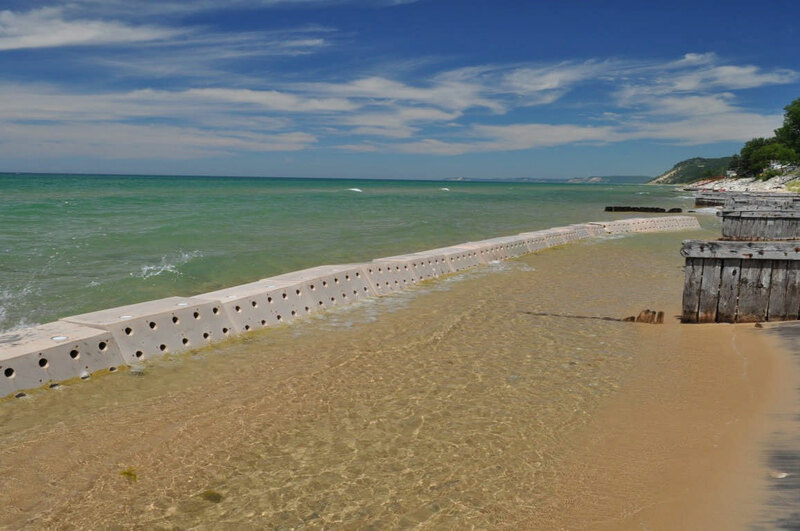 Click the link below to download and read the final report of the pilot Sandsaver install in Lake Michigan. This report was conducted and performed by a 3rd party engineering firm. 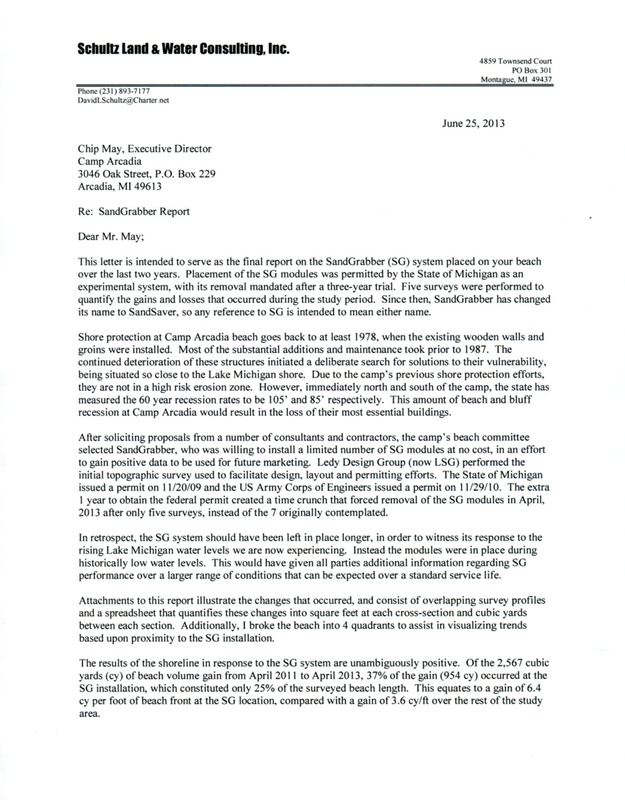 "The results of the shoreline in response to the Sandsaver system are unambigulusly positive." "at the very least, the Sandsaver design not generate adjacent negative impacts associated with shore-normal and impermeable structures. The Sandsaver modules permeability and placement in a shore-parallel orientation demonstrated no negative impacts to adjacent stretches of beaches. "